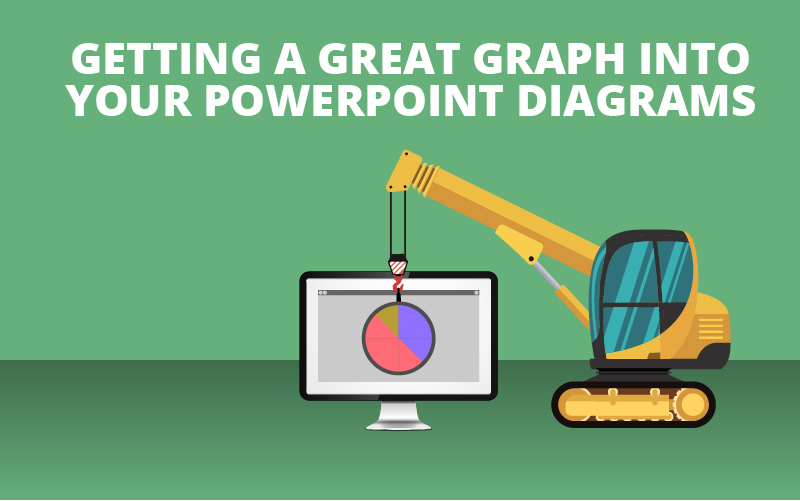 One of the first features you think of when discussing PowerPoint diagrams are their amazing built-in graphs. Graphs are incredibly effective at showcasing and explaining to a group of people where you stand in relation to an aspect of the world around you. For that reason, I will be going through and showing you how to insert a graph into a pre-built slide. Note that the same process for inserting a graph into a pre-built diagram applies whenever you want to insert a graph into any of your projects. I will be using a diagram from our Get My Graphics Library in this example. In some of our diagrams, we have created shapes that hold the appearance of graphs. This is awesome when wanting to create a sleek template. I will be showing you how to add a dynamic graph/chart into the diagram, thus allowing you to easily edit the percentages, colors, size and much more without having to play the role of a graphic designer. Below is our project with shapes that we will replace with dynamic graphs. The first step is to insert a graph that that is the most similar to the shape in the diagram. Keep in mind that you might not be able to find an exact replacement for the shapes that are already inserted into the diagram. In this example, there is a good replacement graph, and we’ll select that one. To find it, you need to go to Insert and insert a chart. For this case, it is a doughnut pie chart. Now, you need to modify the pie chart to look as close to the graphic shape as possible. In this example, there are multiple things that need to happen. The first thing you need to do is double click on the pie graph to start editing the chart. This will bring up a green Excel window with numbers in it. If it doesn’t pop up you can click on Edit Data under the Design Tab while the pie chart is selected. You need to delete two of the rows so that there are only two rows with numbers in them. Also, change to numbers in the 1st Qtr and the 2nd Qtr to be equal to the percentage that is located on the diagram. Delete the title and legend by simply clicking on them and then hitting the delete key. Now you can see that the pie graph is starting to look a lot like the graphic shapes in the pre-built diagram. Next, you need to pull the colors from the diagram and match them to the pie chart that we are going to insert into the project. To do this, you need to double click on either the orange or the blue part of the graph (the colors may be different for you) and then go to the Format Data Point Panel and click on the Paint Bucket. Make sure there is a checked box next to the option “Vary colors by slice”. This will allow you to change the color of each slice (which in our case is only two). You will need to eyedrop the blue with the same blue as that found on the diagram. Then click on the orange slice and make it 100% transparent. The last step is to click on the two slices and the background and remove the borders. Or you will see a white outline surrounding the slices and the background. Now you should see a graph that looks almost exactly like the shape that came pre-built with the diagram. The last step is to delete the shape in the diagram and insert the graph that we just created and modified. Now whenever you want to change the percentage on the diagram, you can easily go into the graph and change a few numbers and the graph will change itself. Beforehand, you would have needed to edit the shape to be approximately the same size and dimensions as the percentage you needed. And believe me, you don’t want to do that. There is so much versatility when it comes to graphs and charts in PowerPoint, and we just scratched the surface of what is possible. Go check out the thousands of other PowerPoint diagrams, graphics, and infographics in our library! And let me know in the comments section below how graphs and charts have improved your projects.